The lovely 1898 Berkeley ferryboat, gracing San Diego Bay with her turn-of-the-century charm and ambiance is available for very special occasions. She has two open-air decks, offering your choice of downtown skyline or sunset views of the harbor. Atmosphere/Decor: The Ladies' deck and dance floor are crowned with Victorian styled stained glass windows, softly backlit after dark. Special Features: Attendees or "Crews" from 5 to 200 may meet on the upper deck of the Berkeley ferryboat. The Berkeley can accomodate 400 guests seated, or up to 1000 guests for a reception. Host your next event aboard the H.M.S. Surprise, a replica of an 18th century Royal Navy frigate used in the Academy Award winning motion picture, "Master and Commander, The Far Side of the World." Special Features: The H.M.S. Surprise, on loan from 20th Century fox Studios, is available for events and gatherings for up to 180 guests. Charter the schooner Californian for corporate team building, private parties or an enchanting evening under the western skies. The Californian can accommodate up to 52 guests while sailing or 100 for dockside receptions. Special Features: Take your group for a sensational afternoon sail or sunset sail on San Diego Bay aboard the 1847 Revenue Cutter replica, Californian. Officially California's State tall ship, she can sail for longer multi-day cruises or just a day on the bay. Our own majestic Star of India is without question the most unique wedding location in Southern California, if not the world. She is the oldest active sailing ship in the world. She has circled the globe 21 times since being built in 1863. 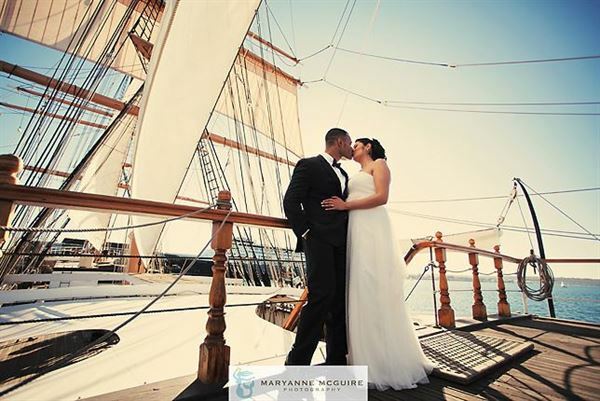 Atmosphere/Decor: Wedding ceremonies are held at the helm, on the Captain's deck, where you'll find the experience truly timeless. Special Features: Wedding coordination, reception planning, catering, entertainment, custom favors, florals, and photography for wedding ceremonies. Or, for a meeting approximately 20 people fit around the Captain's table in the Star's main saloon.